I love blogging at InspyRomance, but today it’s my honor and privilege to introduce Juliette Duncan. Not only she’s a tremendously talented author, she’s a wonderful person, as well. I was beyond thrilled when she invited me to join Potter’s House Books series (my book in the series, Heart Unbroken, is available on pre-order for only 99 cents for a limited time). I hope you’ll enjoy reading these God-honoring, faith-filled books, starting with The Homecoming by Juliette Duncan. Hello! I’m Juliette Duncan and I’m excited to be here and to have the opportunity to share a little about my latest book, The Homecoming, part of the brand new Potter’s House Books series, a series brought to you by a group of 7 Contemporary Christian Authors, some you already know and love, and others for you to meet! Most of the Potter’s House books are Contemporary Christian Romances, stories of love, hope, redemption and second chances. What more could you ask for? “The Homecoming” is an unlikely love story between a humble potter and a famous pop-star, but it’s more than that. It’s a story of God’s love and how He gently woos His precious children, drawing them close, offering second chances and hope in a world that’s lost its way. Kayla’s life revolves around her concerts, tours, fans, and her married boyfriend. As far as she’s concerned, her life is perfect, and she has no need for old-fashioned religion. But to God, she’s a precious child, a special creation, and He loves her with His whole being. He can’t force her to return His love, but when her life begins imploding, He uses an unlikely friend from the past to teach her gently about Himself. A humble potter, Dane Carmichael has a disability, but he has a heart for God, and his simple faith and life fascinate Kayla. But can she give up her life of glamor and stardom for true love? I don’t know about you, but I certainly have family members who’ve walked away from the Lord and it grieves my heart, just it did Kayla’s parents. But I know the God who loves without condition won’t give up on them, and so I pray daily that He will gently woo them back to Himself, and use whomever He chooses to reach them, even a humble potter! His love story is the greatest love story of all. I hope you enjoy “The Homecoming”. You can get it now for just 99c (for a limited time), or it’s free on Kindle Unlimited. 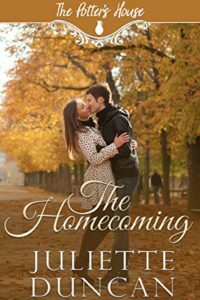 To win a Kindle copy of The Homecoming, please comment below with what you’d do if you were Kayla’s parents. The giveaway will be open until April 3rd, 9:00 PM, and the winner will be randomly chosen from comments. Check out all of “The Potter’s House Books” here. Welcome Juliette! Hi Alexa!Congrats to both of you on your new series The Potter’s House. What an inspiring descriptive series. “God is the Potter and we are the clay.” The imagery gives me goosebumps. As parents, especially believing parents, we need to love our wayward children, just like Christ loved us in the famous love chapter – I Corinthians 13. Love is patient, kind. As parents we need to forgive our children and welcome them home as the prodigal son. Always easier said, than done. Will be looking into this inspiring series. Best Wishes and Happy Easter. Thank you so much, Renate, for your lovely comments! We’re very excited about this series and are looking forward to sharing the stories that God has placed in our hearts with our readers. I hope you enjoy them, and Happy Easter to you too. Good morning, Renate! So grateful to have a reader like you! I loved everything you said about us as parents. I was blessed to read this book, The Homecoming. I think it’s difficult to have a strong Christian relationship with the Lord as a parent and know your child has taken a different path in their life. I think Duncan has written it in a way that all parents can relate, whether they are in the midst of having a wayward adult child or the potential thought of, and see an example of considering what the Lord would have parents do. I’m looking forward to all of the books by the authors of the Potter’s House Books, Verde’s book, too! Congrats on a great start of a series which no doubt will help us be an encouragement to those we come in contact with and our walk with the Lord. Thank you so much! I’m honored to be part of this series, and I hope our books will bring our readers inspiration and encouragement. I’m so glad you enjoyed The Homecoming and that you’re looking forward to the rest of the series! Your new series sounds interesting. I like the potter’s analogy. With a wayward child, I would keep loving and praying, but not preaching at them. Thankfully my children are not wayward but my siblings and parents were. We keep praying for my brother and sister. My parents may have come to the Lord right before they passed away. Hello Diana! Thank you so much for your kind words about our series. Good answer to the question, and thank you very much for sharing! Thanks for your comments, Diana -and yes, never give up praying for your brother and sister, you don’t know what’s going on in their hearts, but God does! Wow, this sounds like a powerful story! As a parent it is always hard to know what is the best way to deal with these challenges. I have to say just keep loving them and showing them how Jesus is working in your life, be there when you can to help them through the seasons of their life. Hello Paula Dye! Great answer. And I agree with you. Homecoming sounds like a very powerful story! Great comments, Paula – I truly think it’s the only way and it’s what Jesus would have done, but sometimes it’s less than easy! Yes, I certainly know how hard it can be, but we just keep trying, don’t we? I don’t have children so it’s hard for me to answer the question. Perhaps my choice not to have children was partially due to me being that wayward child. ;-) I know God didn’t (and doesn’t ) give up on me, so I think that is key. God loves the wayward child even more than the parents do so trust them to God and offer continuous prayers. I had a discussion with a friend last night about a mutual friend who has a 28 year old son with a drug problem. It has just about destroyed her marriage which was already rocky. Her husband has given up on the son but my friend is still supportive, maybe too supportive? How do you know the right thing to do? Sherri, I know just want your friend is going through! My prayers go out to her!! My son will be 32 next and will be celebrating this milestone in jail, he is also addicted to drugs, and he has spent more time in jail than out over the last 5 years. It is SO hard to know the right thing to do!! My heart goes out to you, Paula! I hope it’s okay if I say a prayer? Thank you, Alexa, it has definitely been a long road…and yes, I cannot tell you how grateful I am for the prayers! God Bless all of you! I’m praying for you and your son too, Paula. My heart goes out to you, Paula – I’ll pray for you and your son along with Alexa. LIke I said to Sherry – it’s a fine balance between tough love and being an enabler… but I’m sure you know that! Don’t give up on him, but don’t let him destroy your life either. Just know that God loves your son more than you do, and He won’t give up him. God bless. Thank you very much for sharing, Sherri! That’s so true. It’s difficult to know the right thing to do. I’m so sorry about your friend. I can only imagine how difficult it is for her. My prayers are for her and her son. Hi Sherri – thanks for sharing. My heart goes out to your friend – I understand because my first husband was an alcoholic and was also into drugs, and it’s a fine balance between showing tough love and being an “enabler”. I don’t think I got it right most of the time, it’s so much harder when you’re in the middle of it, easier when it’s only hypothetical, but God knows our hearts, and all we can do is our best at the time and seek to love as Jesus would. I’ll say a prayer for your friend. Welcome, Juliette! Nice to see you here at Inspy Romance! I’ve already read The Homecoming, and as BHRIV said above, you do an excellent job of showing parents loving & praying for their wayward daughter. I think that’s the best we can do as parents, is to continually love our children–wayward or not–and never cease praying for them. Thank you, Brenda! I’m so honored to be in the same series with such amazing authors. I’m looking forward to your book in the series! Thanks Brenda -it’s great to be here and it’s also great to have you as one of the authors in the series! Sound like the series will be very interesting. We worry and we only want the best for our kids but we have to let them make their mistakes and find their place in this world. That’s why we teach them Gods word when they are young and and at some point should they depart, they will find their way back. Very well said, Colleen! So true. And yes, I believe this series will be very interesting. Thank you very much for stopping by! Thanks for sharing your thoughts, Colleen. You’re so right! Oh, this story is close to the heart as I too have “family members who’ve walked away from the Lord and it grieves my heart” (to quote you, because I have no better words to describe this). Lately I’ve had a couple of them in mind, one in particular who is a Pastor’s daughter and she’s getting married soon and won’t have a religious ceremony, not even a small blessing. I’ve had less religious family members do more than that and it really grieves my heart. Her parents seem to have given up and resigned to the fact that both kids are far away from the Lord as they could be. I hope they haven’t given up praying, because my cousins are so dear to my heart that I feel like crying. I’ve been thinking more and more about them since my son was born because I know it’s my responsibility to guide him to the Lord and I’d be at a complete lost if he turned from His way. I totally have no idea what I’d do, but I pray everyday that the Lord can show me how to be a good /sufficiently good parent and teach my son to walk in His ways so that even when he is old he will not turn from it. Thank you so much for sharing, Priscila! Your story has such a profound meaning. I’m so very sorry about your cousins. I hope that they will find their way to the Lord. And to me it sounds like you’re an amazing parent! Thanks for sharing, Priscila. It saddened me to hear about your cousin and her parents – I do pray that they haven’t given hope, because there’s always hope and God will never give up. It’s so important to keep praying because we never know what person or situation He might use to turn their hearts around. And like Alexa said, you sound like you’re a wonderful parent and your son is blessed to have you as his mother! I love the premise of this series sooooooo much! None of us are beyond God’s healing love and redemption, no matter what mistakes we’ve made. Juliette, it was wonderful having you here with us! And thank you for the opportunity, Alexa! It’s been great being here. I’m glad you liked it! 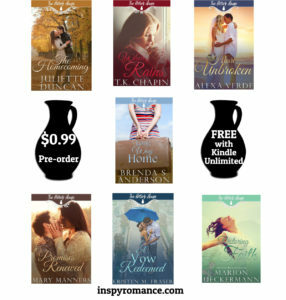 Inspy Romance is an awesome blog!